Becky and I get sent brand guidelines all the time and they play a big part in us understanding how to implement a brand. They come in various forms and the usual things we expect to see are logo use, colours, fonts, often leading into tone of voice. Those elements are very useful, it gives us some guidance and constraints to work with. Where guidelines become problematic for us are when they start to dictate the user experience. One example is a 150+ page document that showed up halfway through a project for a large corporate and made our lives very difficult as designers. This document defined almost every facet of the user interface, right down to menu systems, buttons and how content should be displayed. Some of this was a design imperative, so that the sub site we were creating matched the global site, but due to the context and specifics of the site we were creating, they really hindered our ability to deliver the best user experience. Another example, also from a large corporate, forced us to completely rethink our layouts and user journeys, essentially stripping out any value we could add. 6-8 months of work had to be undone and pushed by the wayside to conform to a design that had much less context than the use it had been defined for. The guidelines also had a lot to say about photography and content, which seemed over-baked. I understand these documents are there to provide rules and ensure consistency. The thing is that during the process of creating an interface or defining a journey for the user, you need to be able to take the core of a brand and evolve its implementation. I have it’s best interests at heart as my goal is to deliver the best experience for the user so they can be fully engaged with the brand. This micro-managed approach I’m sure has an impact on how a brand is perceived and it must hurt the bottom line. When it comes to the content that bring our creations to life, these kinds of guidelines must be problematic too. Something must be done! How can we help clients not get into this mess? I have seen good guidelines, but they are few and far between. When setting out to create the best experience for the user, we need to feel empowered by the guidelines, not feel like we are going to deliver something that doesn’t work. Stewart - as someone who is involved in the strategy behind brand, why do you think these issues arise? What steps can brand designers take to help designers, developers and content creators create the best digital experiences? Sonja and Sharon - how does this affect your ability to create content or steer content strategy? When you're involved in defining tone of voice for a brand, what things do you take into account? Becky - I know you share my pain, what do you think guidelines should do to truly help the design process? The experience you have had with brand guidelines is a perennial one. 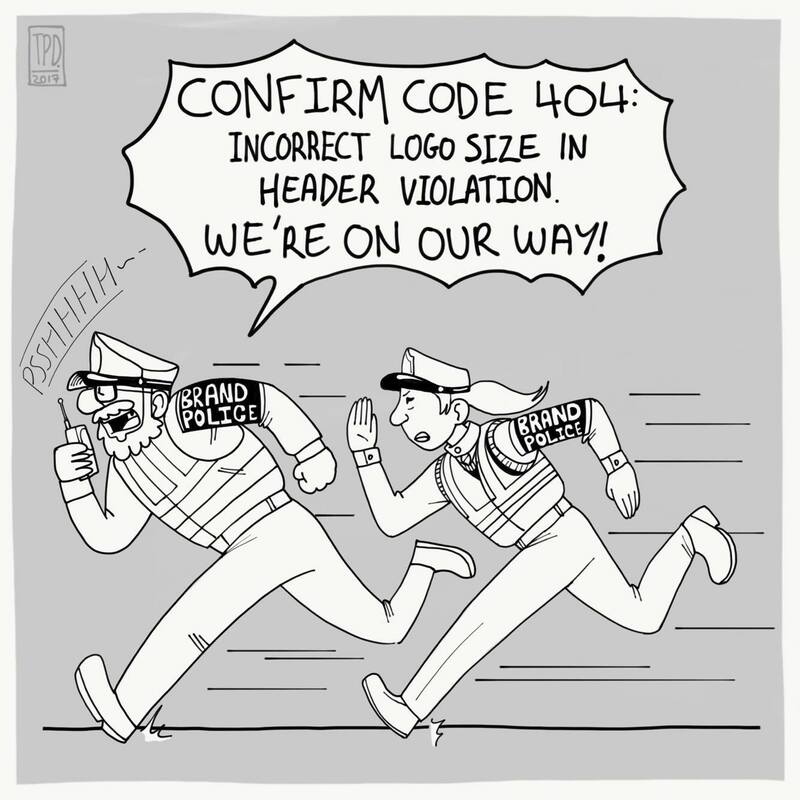 When I was writing and managing (…ahem, ‘policing’) brand guidelines for major brands from the client-side this very same frustration emerged continually. Brand Guidelines, as you have experienced, are often the opposite of “Guidelines”. They are an intransigent rulebook. Herein we establish the first problem: they are a misnomer and euphemism. They are typically the end-product of a corporate re-design/identity process (or refresh), produced by the lead design agency (who may call themselves a brand agency or even a strategy agency). They are then passed to the ‘brand team’ or middle-ranking corporate employees to put into service. Herein we can identify the second problem: ‘Brand’ becomes narrowed into a predominantly visual definition (i.e. design) and is then passed to individuals for implementation (read policing) who perhaps may or may not have a full understanding of how brands actually work. It’s amazing how many people responsible for marketing and branding (on the client-side) actually don’t have qualifications in marketing and branding. It’s even more amazing that those that do have qualifications actually have little talent or instinct for it. Things like “Guidelines” are then very welcome substitutes for professional judgement and informed decision making. They are the friend of the insecure. Dealing with these types is always going to be difficult. Unless you can get access to higher decision-makers then you are in for a struggle. The untalented and insecure wish for a world that snuffs out creative thought, interpretation, questioning, deviation. But there is another perspective on all of this. 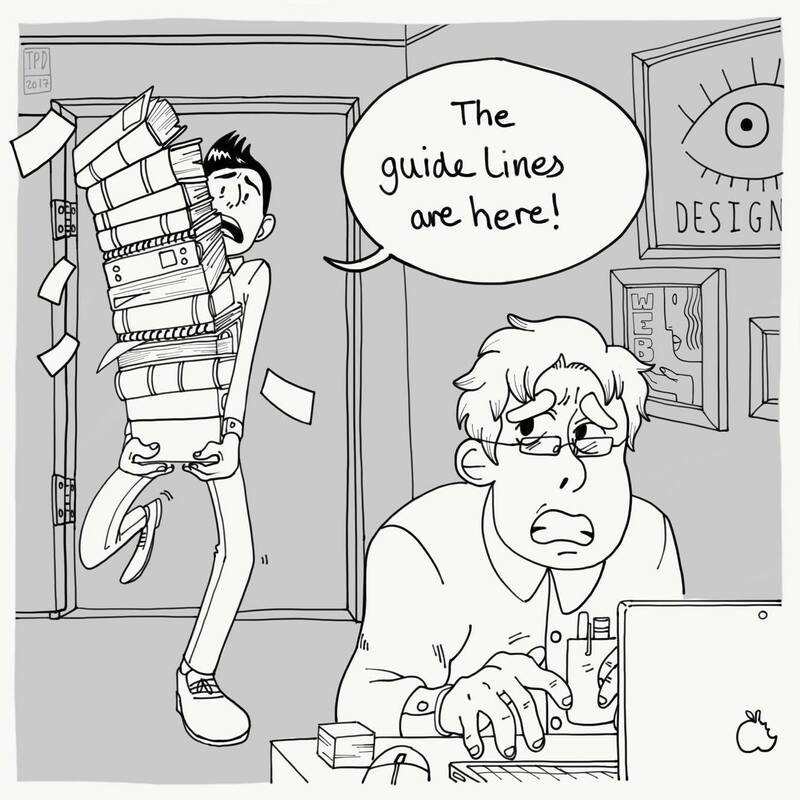 Overly rigid guidelines are also a reaction to designers who don’t understand brands and how they work. That said, the fact of static ‘Brand Guidelines’ (read ‘rule-book’) is anathema to many brands. This is probably more true for brands that are defined by ‘experience’ (service-based brands, roughly speaking). Packaged goods and pharmaceutical brands, for example, are heavily reliant on customer habit and shelf-presence. Rigidity around design is pertinent in this case! Either way, strong brands are outcomes of core guiding principles that inform all customer touch-points. A good set of Guidelines should brilliantly and inspiringly espouse these core themes. So what can the well-meaning small agency David do in the face of the corporate Goliath? The first thing is to establish whether you are dealing with ‘brand police’ or something more intelligent. You can then decide whether you take the money and do as you are told or walk away before you blow a fuse. If you sense you can break through and actually make a difference then you have to dig deeper around the critical area of brand strategy. A deeper appreciation of brand strategy will arm you with the questions and arguments to challenge the brand bible. Brand strategy is fundamentally the process of asking the right, often searching and difficult questions of i. The Brief and ii. The Client and getting real answers back before any pixels are laid down. Get your thinking right before acting. Have you questioned and interrogated the brief? Is the client clear in their own minds who the target audience is? Do they have clarity on what outcomes they seek from your work? Have they projected into the full potential or unseen or unacknowledged opportunities that could be achieved with more scope and flex to the brief (and to the Brand Guidelines)? Demand meetings or communication to ask these questions (and more). Demonstrate to them the level of commitment and added-value you can bring through your higher level of engagement. As you say Ollie, your fundamental motivation is to add value. That’s our sole purpose in business services. If you want to be trusted, show them you can be trusted. I can guarantee that most sets of Brand Guidelines will NOT have supporting insights based on market or consumer knowledge. Good designers (like good researchers) are also good marketeers by instinct, if not training. Use your own instincts and project into the consumer experience relevant to the customer journey of your client’s brand. Even better, ask for any research or reports they may have. If you are building and designing a digital user journey you are in fact defining a critical brand touchpoint. Even better than that, build in some end-user testing research into your Proposal (nay, demand it!). You may even be creating the defining brand experience. Don’t be shy about challenging the Brand Guidelines, The Brief and any erroneous assumptions. Always combine your detailed area of excellence with a strategic perspective. Creative Director of Valuable Content and Pub School teacher. On a mission to help you create marketing people love. From a content point of view, most brand guidelines I’ve come across are pretty irrelevant. They’re far more concerned with the visual side of things, so are far less prescriptive on what you can and can’t say. As long as the font and spacing are correct you can write whatever you like! You might think that’s a good thing, but it would be super useful for brands to put serious thought into the words they use to put their message across. I’d suggest brand guidelines include story, mission, and manifesto. What are we truly about as a business, and what words will we use to articulate that to the world? A tone of voice guide is often viewed separately from the brand guidelines, but really they’re two halves of the same whole. How is the brand communicating with the world? Tone of voice is an interesting one, because a business needs more than one. You’ve got your ‘suit and tie’ voice for when you’re dealing with some aspects of your business, you’ve got your chatty voice for social media, you’ve got a coaching voice when you’re helping clients with tricky challenges, you’ve got your friendly expert voice for when you’re writing blogs. Some guidance on how to navigate this would be really useful. An example of a great tone of voice guide that digs deeply into the ‘why’ of the words you use, in beautifully simple language, was produced by the University of Leeds. Getting this level of thought into the words you use would make brand guidelines much more useful documents, certainly from a content point of view. And, because they are focused on purpose, and how you want the reader to think and feel, I’d have thought they would make life easier from a UX point of view too. I can feel everyone’s pain here, all from slightly different angles, and this clearly highlights it’s time for change. Interestingly from the client side, I would say they also feel our pain! From direct experience with the client, who feel as restricted as we do by the “guidelines”, to speaking with a very close friend who is an end user of the brand (one of the “policy” people as Stewart puts it), the guidelines become complicated and unfriendly for those within the corporation that have to use them. At a practical level, documents either look horrific and mismatched because the people on the ground just don’t understand how to implement a brand, or, more commonly from what I have heard, they are ‘forced’ to use unwieldy macro-filled Word documents that try and fail to allow for maintaining the brand across every possible iteration of a company document – be that a proposal, an internal memo, an email, a pitch presentation. So what can we do? The brand guidelines need to be used by so many different people, with many different needs, skills and experiences, and they must continue to be helpful and practical in an ever-changing world of multiple user experiences. Plus, they must stay true to the brand – in all facets of what that means. I would say the fundamental answer must be – it has to be flexible, evolving and always, always driven by user-need. As we are experiencing more and more in our world of “UX”, everything overlaps, is interrelated and can’t be done separately to deliver a great effect. You can’t plan and deliver the best user experience if you only focus on the business objectives and the design – what about the audience, content, technical requirements? I’d argue that brand encompasses everything we do – it isn’t a stage we do at the beginning, it isn’t a 150 page rule book that we can chuck at anyone working on the project. The brand guidelines (if that is what we should still call them) should be exactly what a guideline should be – “a general rule, principle, or piece of advice” – so a suggested high level application, not a dictation of how something should look, work and feel down to the finite specifics. The guidelines should cover all of the above list, in a format relevant to each user or use case, and could be evolved throughout the project (depending on how refined they are at the beginning). Any ‘guidelines’ for online, for example, should be online, and should be open and flexible to change. Stewart is right, that aside from reframing our understanding of ‘brand’, the action with equal important is communicating with, questioning and challenging the client. Do we all understand the brief, the audience, the brand itself? Has research been done? Do the brand guidelines reflect this and provide what we need? In our opinion, if the client isn’t open to challenge and change, it’s not a project we’re interested in. We can’t help them to deliver real value and provide an excellent user experience, if they don’t want to get down and dirty with what their brand really means. Who wants to have a go at a new name for ‘brand guidelines’? Content marketing strategist & Pub School teacher at Valuable Content. Brand guidelines are a huge challenge, for both client and agency partners. I like the empathy you show for people struggling with the challenge on both sides. The brand guidelines are used by so many people now in so many different ways that I wonder if the days of presenting them in flat, print format are done. How about creating the guidelines as a piece of valuable, interactive content in their own right? Becky – I love your fulsome list of what to incorporate in the guidelines. In an ideal world it would be good to opt for the ‘show don’t tell’ approach, and link to lots examples of how the brand is/could be used in the real world. I like the way the University of Leeds do this in the Tone of Voice guidelines Sharon shared. Stewart and Ollie – I back your call for less rigidity and more trust in how people interpret the brand. Perhaps ‘freedom in a framework’ is how this should be approached? Brand leads all our projects. As a content strategist I first want to understand the story to tell through the content I advise the business to share. What does this company stand for and believe in? Why do you do what you do? What’s the backstory and message you want to communicate? It’s rare to find these written and understood clearly, even with large corporate clients. So my first job is to help our clients uncover that story and brand message, through research with top teams and always with their customers too. Content grounds a brand so an authentic brand story is vital if you want to produce differentiating content that hits home with customers and employees alike. It would be great if more businesses understood the need to think through their brands from the customer perspective, in the widest sense, and produced engaging, flexible guidelines for all the many trusted parties to implement on their projects. Your responses have really made me think. I don’t know if I’ll ever look at brand guidelines in the same way again!